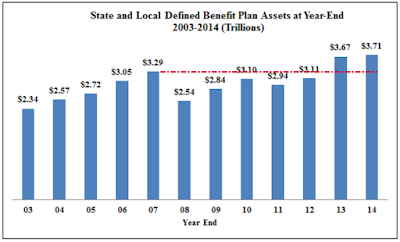 One of my constant themes over the past few years is the underfunding of state and local pension plans. Illinois is particularly bad, but let's look at some aggregate data. The National Association of State Retirement Administrators (NASRA) provides this grim-looking annual picture. 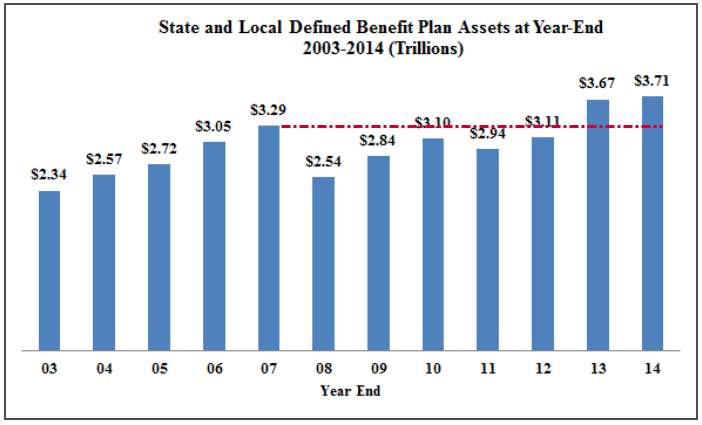 Between the end of 2007 and end of 2014, pension plan assets rose from $3.29 trillion to $3.71 trillion. That's a total rise of 12.76%. Plan assumptions are generally between 7.5% to 8.25% per year! 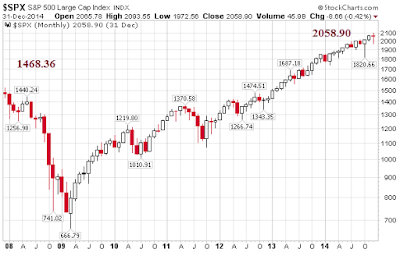 In the same timeframe, the S&P 500 rose from 1489.36 to 2058.90. That's a total gain of 590.54 points. Percentage wise that's a total gain of 40.22%. It's also an average gain of approximately 5.75% per year. In spite of the miraculous rally from the low, total returns for anyone who held an index throughout has been rather ordinary. The first chart is not a reflection of stocks vs. bonds because bonds did exceptionally well during the same period. To be fair, the first chart only shows assets, not liabilities, but we do know that pensions in general are still enormously underfunded, with Chicago and Illinois leading the way. Reader Don pinged me with this comment the other day: "Nearly all public pension funds have a negative cash flow, meaning they pay out in benefits each year more than they receive in contributions. For all public pension funds, the negative cash flow is approximately 3% of assets, which means an average fund needs to produce an annual return of 3% to maintain a stable asset value." That's fine if assets have kept up with future payout liabilities and plans are close to fully funded. However, it is 100% safe to suggest that neither condition is true. 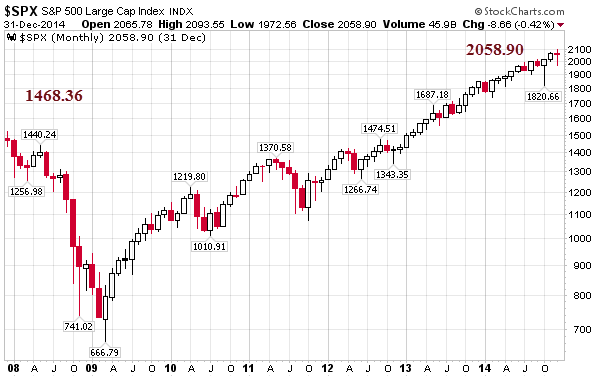 So here we are, after a massive 200% rally from the March 2009 low, and pension plans are still in miserable shape. And plan assumptions are still an enormous 8% per year. Let me state emphatically, that's not going to happen. Stocks and junk bonds are enormously overvalued here. 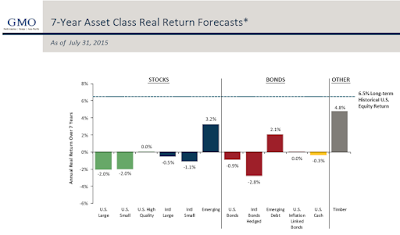 "The chart represents real return forecasts for several asset classes and not for any GMO fund or strategy. These forecasts are forward‐looking statements based upon the reasonable beliefs of GMO and are not a guarantee of future performance. Forward‐looking statements speak only as of the date they are made, and GMO assumes no duty to and does not undertake to update forward‐looking statements. Forward‐looking statements are subject to numerous assumptions, risks, and uncertainties, which change over time. Actual results may differ materially from those anticipated in forwardlooking statements. U.S. inflation is assumed to mean revert to long‐term inflation of 2.2% over 15 years." 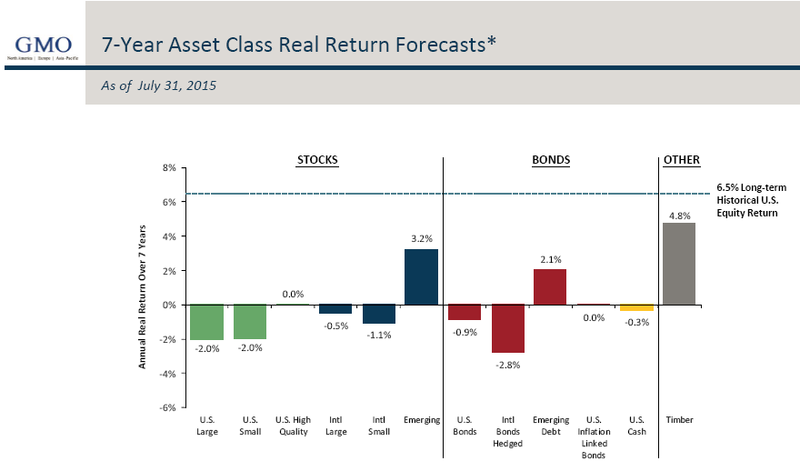 Over the next 7 years GMO believes US stocks will lose money (on average), every year. Those are in real terms, but returns are at best break even, assuming 2% inflation. Bonds are certainly no safe haven either. I strongly believe GMO has this correct. Even if one assumes those GMO estimated returns are wildly off to the tune of four percentage points per year, pension plans needing 8% per year will be further in the hole with 4% per year annualized returns. I have a musical tribute to imagination in regards to pension finances, especially imagination in Illinois. Illinois house speaker Michael Madigan and Chicago governor Rahm Emanuel believe tax hikes are the answer. Both are sorely mistaken. Here are a few viewpoints to consider. The only way out of this mess is a pension restructuring coupled with municipal defaults.